Garmin AC Home Charger (ta-010-10723-00) | Discount GPS Accessories from mysatnav.ie Ireland's leading GPS & Sat Nav store. 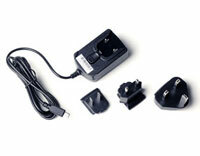 A/C charger for Garmin products, includes UK & Euro plug adapters. Ideal when travelling with your Garmin GPS. Never let your battery run dead again!